By Patrick de Pelsmacker and Nathalie Dens, eds. In the first part, important aspects of advertising messages that influence advertising effectiveness are discussed, with contributions on advertising strategies and branding, advertising creativity, emotional and informational advertising strategies, effective arguments in advertising and the use of celebrity endorsers. In the middle part, a number of studies on advertising in new media such as internet advertising, advertising in computer games (advergames), and the usage of new media by different target groups, are collected. In the final part on context, the contributions elaborate among others on product placement, the impact of cultural differences on advertising effectiveness, how men and women differ in their reactions to advertising, the connection between advertising and human values, and advertising aimed at children. 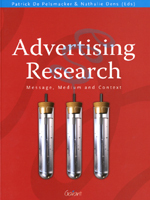 This book compiles the best research reports presented at the 7th ICORIA - International Conference on Research in Advertising - conference, organized by the European Advertising Academy (E.A.A. ).